On a number of occasions I have featured examples of brands creating interactive print ads. 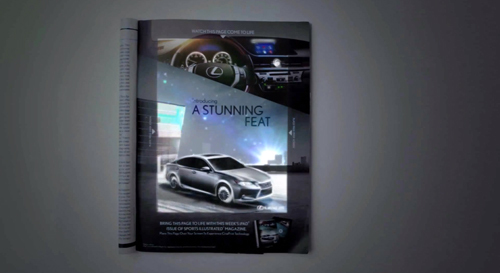 In this latest example, the new Lexus 2013 ES is seen changing colors, turning on its headlights and exposing its interiors while music plays in this interactive print ad for the October 15th Sports Illustrated issue. Not too long ago, talent determined greatness. Today, talent is a given, but training is what separates the exceptional from the merely promising. So to help athletes everywhere reach their true potential through better training, Nike along with ad agency R/GA New York created an immersive digital experience for the SPARQ program (Speed, Power, Agility, Reaction, and Quickness). Athletes could now follow the same training regimens as professional athletes through detailed, customized video demonstrations delivered via iPods or handheld video players that made it accessible anywhere. 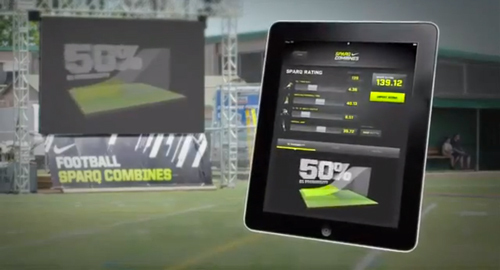 The SPARQ website also let athletes set goals, track progress, find Nike SPARQ Trainers across the country, get an official SPARQ rating, and purchase gear. The Renault Espace is a large MPV from French car-maker Renault. With their new iPad app they have given users an onboard view of the Espace like never before. 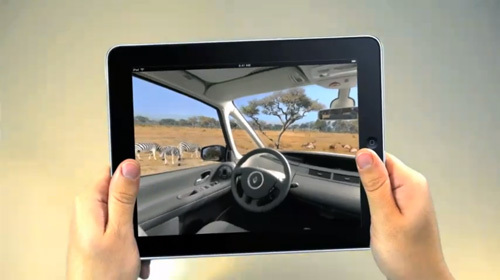 The application is a 360 degree interactive video, where all the user needs to do is tilt their iPad and explore all the angles as if they were right there. 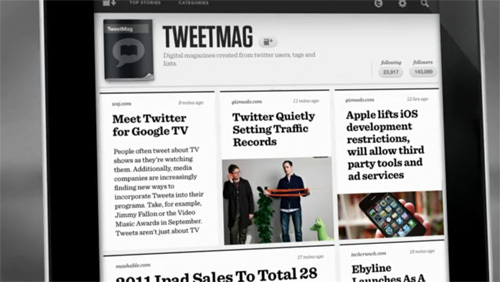 TweetMag is kind of like Flipboard. The difference being that TweetMag uses only your Twitter account to create simple magazines. Even though it’s not the first of its kind in the market, it definitely looks great, provides a friendly user experience with a few extra features and has a neat way of categorizing your feed magazines (by things like #tag, lists etc). For more you can also check out their site.